The 10mm Auto (10×25mm, official C.I.P. nomenclature: 10 mm Auto, official SAAMI nomenclature: 10mm Automatic) is a powerful semi-automatic pistol cartridge first developed by American Jeff Cooper and introduced in 1983 with the Bren Ten pistol. Its design was adopted and later produced by ammunition manufacturer FFV Norma AB of Åmotfors, Sweden. Although it was selected for service by the Federal Bureau of Investigation (FBI) in 1989 from the aftermath of the 1986 FBI Miami shootout, the cartridge was later decommissioned (except by the Hostage Rescue Team and Special Weapons and Tactics Teams) after their Firearms Training Unit eventually concluded that its recoil was excessive in terms of training for average agents and police officers' competency of use and qualification, and that the pistols chambered for the cartridge were too large for some small-handed individuals. The Bren Ten (left) and Smith & Wesson Model 610 Classic (right), 1983. The 10mm Auto cartridge was originally drafted and championed by eminent firearms expert Lieutenant Colonel John Dean "Jeff" Cooper, and referred to as the ".40 Super" (not to be confused with the .40 Super cartridge developed in 1996). It was designed to be a medium-velocity pistol cartridge with better external ballistics (i.e., flatter trajectory, greater range) than the .45 ACP and capable of greater stopping power than the 9×19mm Parabellum. When FFV Norma AB (now Norma Precision AB) designed the cartridge at the behest of Dornaus & Dixon Enterprises, Inc. for their Bren Ten pistol (a newly developed handgun with design inspired by the CZ 75), the company decided to increase the power over Cooper's original concept. The resulting cartridge—which was introduced in 1983 and produced since—is very powerful, containing the flat trajectory and high energy of a magnum revolver cartridge into a relatively short, versatile rimless cartridge for a semi-automatic pistol. The case was derived from the .30 Remington rifle round, cut down and the walls straightened to accept the same diameter bullet as the much older .38-40 Winchester. One of the first issues with its early acceptance and prosperity was the result of quality problems in consequence from rushed production to meet copious (some even defaulted) pre-orders of the pistol it was originally—as well as then being only—chambered for: the Bren Ten. An example being the peculiar circumstances surrounding the pistol's distribution at its primary release, leading to a number of initial Bren Tens sent to dealers and customers without magazines (the magazines themselves had complications). The relatively high price of the Bren Ten compared to other pistols of the time (manufacturer's suggested retail price in 1986 was U.S. $500 in that year's dollars) was another factor in its demise, and the company was eventually forced to declare bankruptcy, ceasing operations in 1986 after only three years of inconsistent, substandard production. 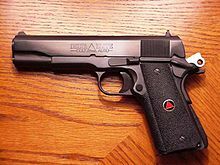 Had it not been for Colt's Patent Fire Arms Manufacturing Company making the unexpected decision in 1987 to bring out their Delta Elite pistol (a 10mm Auto version of the M1911) and later, the FBI's adoption of the caliber in 1989, the cartridge might have sunk into obsolescence, becoming an obscure footnote in firearms history. Due to media exposure in the television series Miami Vice, where one of the lead protagonists had used the pistol as his primary signature weapon, demand for the Bren Ten increased after manufacturing ceased. In the succeeding five years, prices on the Standard Model rose to in excess of U.S. $1,400, and original magazines were selling for over U.S. $150. The Federal Bureau of Investigation briefly field-tested the 10mm Auto using a M1911 pistol and a Thompson Model 1928 submachine gun before adopting the Smith & Wesson Model 1076 in 1990; a short-barreled version of the Model 1026 with its slide-mounted decock/firing pin block safety supplanted by only a frame-mounted decocker. A contract was signed with Heckler & Koch to produce a specialized quantity of the MP5 utilizing the cartridge, designated MP5/10 for use by their Hostage Rescue Team and Special Weapons and Tactics Teams. Since 1994, both units still field the weapon and caliber to this day. During testing of the caliber in 1988, it was decided that the full-power commercial load of the 10mm Auto was the best available semi-automatic pistol cartridge for law enforcement usage, but it produced excessive recoil for most agents. Thereafter, experiments were carried out, and a specification for reduced-recoil ammunition was created. The requirement was later submitted to the Federal Cartridge Corporation for production and followed further review. This became known as the "10mm Lite", or "10mm FBI" load, remaining common from various manufacturers today. With some pistol reliability problems increasing in this lighter load, Smith & Wesson observed that a version of the 10mm case reduced to 22 millimeters in length from the original 25 mm could be made with the retained performance parameters of the "10mm Lite". This altered cartridge was named the .40 Smith & Wesson. The shorter case allowed use in pistols designed with similar dimensions to those chambered in 9mm Luger, with the advantage that smaller-handed shooters could now have smaller-frame semi-automatic handguns with near—or in some cases, exact—10mm performance. Colloquially called the "Forty Cal" and other synonyms, this innovation since became a common handgun cartridge among law enforcement agencies and civilians in the United States, while the parent 10mm Auto remains fairly popular. Colt, Dan Wesson Firearms, Glock, Springfield Armory, Kimber Manufacturing, Nighthawk Custom, Smith & Wesson, STI International, Armscor, and Tanfoglio still offer handguns in 10mm Auto. In 2015 SIG Sauer entered the 10mm marketplace with their P220 model chambered in 10mm. Ruger introduced a 10mm auto model to their popular SR1911 line in mid 2017, followed by their Blackhawk, Redhawk and 10mm GP100 Match Champion and Wiley Clapp models in 2018. Springfield Armory began 2019 by producing a XDM chambered in 10mm. 10mm Auto maximum C.I.P. cartridge dimensions. All sizes in millimeters (mm). Common rifling twist rate for this cartridge is 406.40 mm (1 in 16 inches), 6 grooves, Ø lands = 9.91 mm (.390 in), Ø grooves = 10.17 mm (.4005 in), and land width = 3.05 mm (.120 in). A large pistol primer is used. The Commission Internationale Permanente pour l'Epreuve des Armes à Feu Portatives (C.I.P. ; Permanent International Commission for the Proof of Small Arms) rulings indicate a maximum pressure of 230 MPa (33,000 psi). In C.I.P. regulated countries, every pistol/cartridge combination is required to be proofed at 130% of this maximum C.I.P. pressure to certify for sale to consumers. 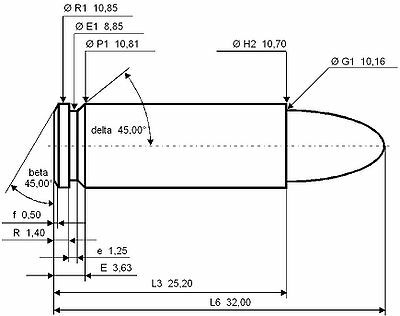 The Sporting Arms and Ammunition Manufacturers' Institute (SAAMI) maximum pressure limit for the 10mm Auto is set at 37,500 psi (259 MPa). At full potential, the 10mm Auto produces energy slightly higher than an average .357 Magnum load and below standard .41 Magnum rounds. 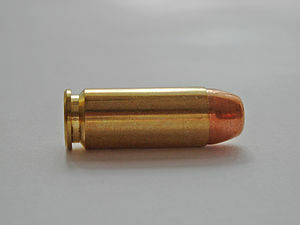 The cartridge is considered to be high-velocity, giving it a less-curved flight path upon firing (also termed "flat-shooting") relative to other handgun cartridges. In its lighter loadings, the 10mm Auto is an exact duplicate of the .40 S&W cartridge. More powerful loadings can equal or exceed the performance of the .357 Magnum, and retain more kinetic energy at 100 yards than the .45 ACP has at the muzzle. The 10mm outperforms the .40 S&W by 270–300 ft/s (82–91 m/s) for similar bullet weights when using available full power loads, as opposed to the "10mm FBI" level loads still found in some ammunition catalogs. This result is due to the 10mm Auto's higher SAAMI pressure rating of 37,500 psi (259 MPa), as opposed to 35,000 psi (240 MPa) for the .40 S&W, and the larger case capacity, which allows the use of heavier bullets and more smokeless powder. The 10mm Auto is marketed for hunting, defensive, and tactical use and is one of the few semi-automatic, rimless cartridges that is legal for hunting white-tailed deer in many U.S. states. The round makes the "Major" power factor ranking in the International Practical Shooting Confederation, even in lighter loadings. The FBI Hostage Rescue Team, Special Weapons and Tactics Teams, and various other law enforcement agencies continue to issue or authorize the use of 10mm, including: the Coconut Creek Police Department, Plano Police Department, Glasgow MT Police Department, Weimar Police Department, and the San Francisco Bay Area Rapid Transit (BART) Police Department. In military use, the government of Denmark has issued the Glock 20 to the Slædepatruljen Sirius (Sirius Sledge Patrol) headquartered in Daneborg, Northeast Greenland. The pistols were issued as a defense against polar bears which the unit encounters during patrols. 10mm Auto FMJ cartridge headstamp and primer. 10mm Auto (left) compared to a 9×19mm Parabellum cartridge (right). Left to right: .357 SIG, 10mm Auto, .40 S&W. Winchester Ammunition Black Talon 10mm Auto SXT. Colt Delta Elite with 200 grain Black Talon 10mm Auto SXT ammunition. Kimber Custom Target II with 6" 10mm Nowlin barrel. 10mm Auto JHP cartridges inside Dan Wesson Commander Classic Bobtail magazines. ^ a b "AMERICAN SPECIAL OPS – FBI HRT". Retrieved 2015-01-30. ^ a b "AMERICAN SPECIAL OPS – FBI SWAT". Retrieved 2015-01-30. ^ "FBI – Tools of the Trade – SWAT (Text Only)". Retrieved 2015-01-30. ^ a b DeMille, Dianne; Priestley, Stephen (December 2005). "Permanent Presence: Recruiting, Training, & Equipping Rangers in the Arctic". Canadian American Strategic Review. Archived from the original on 2010-07-08. Retrieved 2015-01-30. ^ Donnelly, John J. (1987). The Handloader's Manual of Cartridge Conversions. Stoeger Publishing Company. p. 941. ISBN 0-88317-136-8. ^ Howell, Ken (1995). Designing and Forming Custom Cartridges For Rifles and Handguns. Precision Shooting, Inc. p. 546. ISBN 0-9643623-0-9. ^ a b c d e f g h i j k "C.I.P. – Table of Dimensions for Cartridge and Chamber of 10 mm Auto" (PDF). Retrieved 2015-01-30. ^ a b c d e f g h i j "SAAMI – Maximum Cartridge/Minimum Chamber Drawings for 10mm Automatic" (PDF). Archived from the original (PDF) on 2015-01-30. Retrieved 2015-01-30. ^ a b "C.I.P. – List of TDCC – Tab IV – Pistol and revolver cartridges". Archived from the original on 2015-01-30. Retrieved 2015-01-30. ^ a b c d "SAAMI – Velocity & Pressure Data: Centerfire Pistol & Revolver" (PDF). Archived from the original (PDF) on 2015-03-19. Retrieved 2015-01-30. ^ "Glock 20 | G20 | 10mm Pistol | GLOCK USA". Archived from the original on 2015-03-27. Retrieved 2015-01-21. ^ a b c d e "The 10mm Auto Cartridge". BREN-TEN.com Website. Retrieved 2015-01-30. ^ Ayoob, Massad (2007). The Gun Digest Book of Combat Handgunnery (6th ed.). Iola, Wisconsin: Gun Digest Books. p. 99. ISBN 978-0-89689-525-6. ^ "Terrific Ten: 10mm Auto". Shooting Times. ^ "Dornaus & Dixon Enterprises And The Bren Ten PART 3: The Demise of Dornaus & Dixon And The Bren Ten". BREN-TEN.com Website. Retrieved 2015-01-30. ^ "The Bren Ten In Detail PART 1: Bren Ten Production Modifications". BREN-TEN.com Website. Retrieved 2015-01-30. ^ Hogg, Ian V.; Walter, John (29 August 2004). Pistols of the World. David & Charles. p. 88. ISBN 0-87349-460-1. ^ Fjestad, S. P. (1992). Blue Book of Gun Values (13th ed.). Blue Book Publications, Inc. ISBN 0-9625943-4-2. ^ a b Sweeney, Patrick (30 May 2008). The Gun Digest Book Of The Glock. Iola, Wisconsin: F+W Media. pp. 60–61. ISBN 978-1-4402-2427-0. ^ Hill, Tracie (2008). "WHAT'S NEW". 10 (2nd. QTR., 2008). The American Thompson Association: 6. Retrieved 2015-01-30. ^ Ballistics information on Underwood Ammo's full-power 180 gr (12 g) 10mm load Archived 2015-01-21 at the Wayback Machine. ^ Ballistics information on Federal Premium Ammunition's "10mm Lite" style American Eagle 180 gr (12 g) 10mm load. ^ Ballistics information on Federal Premium Ammunition's American Eagle 180 gr (12 g) .40 S&W load. ^ Sweeney, Patrick (10 December 2004). The Gun Digest Book of Smith & Wesson. Iola, wisconsin: Gun Digest Books. p. 199. ISBN 1-4402-2714-4. ^ "Natchez Shooters Supplies – COR-BON 10mm Auto 200 gr Hunting Penetrator 20/box". Archived from the original on 2015-01-21. Retrieved 2015-01-30. ^ "Hornady Manufacturing Company – 10mm Auto 165 gr FTX® Critical Defense®". Archived from the original on 2015-01-21. Retrieved 2015-01-30. ^ Hawks, Chuck (2002). "Handgun Hunting". Archived from the original on 2011-05-01. Retrieved 2015-01-30. ^ Quinn, Jeff (2005-10-26). 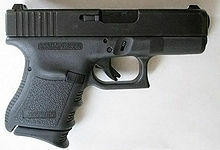 "Glock Model 20 10mm Auto Pistol". Retrieved 2015-01-30. ^ "World Small Arms Inventory". Retrieved 2015-01-30. ^ Richman, Josh; Alund, Natalie Neysa (2014-01-22). "BART police shooting: Still unclear whether fellow officer mistook sergeant for threat". San Jose Mercury News. Retrieved 2015-01-30. Rainey said BART officers typically carry a 10 mm Glock or a .40-caliber Sig Sauer semi-automatic handgun, although some are authorized to carry other weapons. ^ "Automatics and Bolt-actions: Danish Small Arms in Greenland". Canadian American Strategic Review. May 2005. Archived from the original on 2008-09-20. Retrieved 2015-01-30. Most Danish units use 9mm automatics like the CF but the Sirius Patrol learned through hard experience that 9mms had insufficient 'stopping power' to deal with angry adult polar bears. As a result, Sirius Patrol members carry a more powerful 10mm pistols for self-defence, employing the 10mm Glock 20 automatic. ^ "Denmark Special Operations and Counterterrorist Forces – Slaedepatruljen Sirius - The Sledgepatrol Sirius (Arctic LRRP; Navy)". Special Operations.com. 2000. Archived from the original on 2011-01-13. Retrieved 2015-01-30. The weapons carried also reflect the harsh conditions. Only bolt-action rifles (M17/M53) performs reliably. The standard SIG210 Neuhausen sidearm was recently replaced by the 10mm Glock 20, as the stopping power of multiple 9mm rounds proved to be insufficient against a polar bear. ^ Collins, Whit (1987). "Centimeter: The Gun". American Handgunner. Wikimedia Commons has media related to 10mm AUTO.